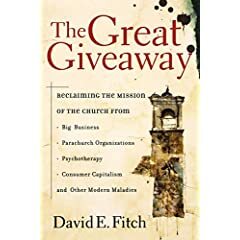 The finale of a three-part review (Part 1, Part 2) of David E. Fitch's The Great Giveaway: Reclaiming the Mission of the Church from Big Business, Parachurch Organizations, Psychotherapy, and Consumer Capitalism. Fitch starts this chapter with a bang: what would happen in a church if a woman stood up during Sunday service and announced that she just found out she has breast cancer? The kicker: she says she has no health insurance. Evangelicals talk a great deal about helping others, but our execution is profoundly flawed. We tend to think of benevolence and justice as something a Christian individual does on his or her own. Fitch notes that justice begins inside the Body of Christ and extends outward. We serve our own as a community and our community serves those outside the community. We owe as much benevolence to the brethren as we do to the poor and hurting outside the church doors, But, too often, we fail to see how we ignore people within our own congregations as if the only brownie points we get from God are for helping strangers. Like everything else, we've mangled the way the church should reach out. We've made it too individualized, the old "my ministry" mantra. But Fitch claims no real social justice exists apart from the local church as a whole operating to meet the needs of the needy. The source for our broken ideals of justice and mercy are rooted in democracy and capitalism. Democracy marginalizes the minority and the weak, while capitalism exploits them. Our entire culture is based on winners and losers, but the are supposed to be no winners and losers inside the Church. The Church, so co-opted by culture, cannot see the malignancy that capitalism and democracy bring to this issue of justice. Christ's justice is not of this world and it trumps the systems we adhere to. The Kingdom of God supercedes politics and economics. We cannot say we are righteous if we fail to understand that social responsibility in the Bible is a component of righteousness. Likewise, we base a person's value on his or her job, not on the value that Christ gives a person. The American Church's obsession with big business means it can no longer discern business success from spiritual success. We must learn that the two cannot abide together, much less determine levels of success in the Kingdom of God. As to the woman suffering from breast cancer, Fitch recommends that churches set up leaders who hear requests for aid. These teams go beyond just handing out money, but seek to resolve sin issues in the needy person's life that may have led them into the state they're in. They work with the needy to help them overcome practices that caused their need, hold them to accountability, and offer grace. In the boldest move of all, Fitch recommends that no benevolence be given outside the local church. If people need help, one of the requirements must be that they join the worshiping body. With that given, no one walks alone through trials. Apart from the misguided digs at democracy and capitalism (which I'll discuss further down), this chapter is easily the best in the book. Nearly everything Fitch discusses you've already read on Cerulean Sanctum. The Church in this country is simply not speaking about corrupt business practices, jobs, unemployment, health care, and a host of other issues that come down to everyday needs in the lives of people around us. We're too stuck in godless bootstrap thinking and "God helps those who help themselves." But that's not Kingdom thinking; it's a cheap way to excuse us from being responsible to others in our community. As we know, though, Jesus praised the Good Samaritan and not the smug priests and Levites. Real community means that one person's problem is everyone's problem. Amish and Mennonite communities understand this, but we Evangelicals are too stuck in our self-righteous modernity to get it. As to Fitch's woeful understanding of democracy and capitalism, he commits the classic blunder of lumping defective practices in with proper practices, calling it all wicked. Capitalism and democracy in and of themselves are neutral systems. Both can be abused, Both can offer great results. Capitalism goes wrong is when it globalizes. Capitalism is an outstanding form of economics when coupled with local economies. Our country largely operated in this manner early on. Localized economies that practice capitalism cannot afford to have winners and losers because losers damage the community. If one farmer undercuts everyone in the community and puts others out of business, the entire community suffers for the bankruptcies that result. Capitalism within localized economies is naturally self-correcting. (Other balancing factors exist, but that's a whole 'nother post, as they say.) But on a globalized scale, winners and losers are natural because the losers can be located so far away that they (supposedly) do not affect local, regional, or even national communities. That's wrong, though. We can't operate that way even though it looks like we won't be the ones to suffer. Then answer is to revitalize capitalism within local communities, not villify it altogether. The same goes for democracy. Despite this problem in the chapter, Fitch nails our mistaken attitudes toward helping others and offers excellent solutions to better the Church's outreach to the broken and needy. We've capitulated to psychobabble in our churches. Instead of operating from Biblical principles of sin, repentence, and restitution within a spiritual family, we've chosen to dignify sin through the manmade nonsense we call psychotherapy. Pyschology is a worldview that competes against Christianity. As a result, it cannot be adequately reconciled with Christianity. Pyschology exalts the self, while Christianity says the self must die at the cross. Modernism created psychology because it sought scientific and rational explanations for Man's broken image. Like all philosophies that have their origins in modernism, psychotherapy promotes individualism at the expense of community and preaches tolerance of thoughts and actions the Church says should never be tolerated. The solutions to Man's problems lie not in psychotherapy, but in Christ. The Church needs to recover its role as the primary God-approved means of bring mental health into the lives of the shattered. Psychotherapy wars against true discipleship, making it hard for Christians caught in psychotherapy's insidious trap to grow closer to Christ. The Church must distance itself from psychotherapy and refrain from explaining Mankind's problems in psychological terms. True spiritual counseling rooted solely in the Scriptures should be restored to our churches. The Church must replace the psychotherapist's couch. Along with the office of trained spiritual counselor, Evangelicals must restore the confessional. Much damage results from Evangelical churches shunning the hearing of personal confessions. We've attached too much judgment and not enough grace to those who have sinned and seek repentence. In many ways, our laxity toward personal confession may have been the impetus that pyschotherapy needed to gain a foothold in the Church. You'll find no arguments from me against Fitch's points in this chapter. Every argument is salient and well-documented. In fact, I would say my overview does a disservice to the breadth of analysis Fitch offers for how we traded truth for a lie. Education is one of the cornerstones of discipleship. Unfortunately, the way we school our young works against true discipleship and moral education. Evangelicals gave away rituals and rites of passage that set godly waypoints in our walks with Christ. We've also placed too much emphasis on the freedom of the individual to pursue his or her own beliefs rather than indoctrinating that individual into the beliefs of the believing community. Lastly, we've turned our kids over to those people who would indoctrinate them in a worldview foreign to true Christianity. Public school is not the Church. The civil religion taught in public schools is not remotely Christian. Values education is a ruse, too, since no one set of values in our country can cover all values systems. The public schools cannot be trusted to teach anything Christian; only the Church can do that. Homeschooling (here comes the flame war) is not the Church. No one family can adequately stand in for what the Church community as a whole can provide. One family cannot be a culture in itself, nor is it capable of withstanding all of secular culture. A single family is also blind to its own sins, leaving holes in a child's moral education. Family dysfunctions are only multiplied within homeschooling environments. Parochial schools are not the Church. A tendency exists even in Evangelical schools to promote allegiance to country over allegiance to the Kingdom of God. Parochial schools often ape their public school counterparts, but add a sheen of Christianity over the top. They do not always begin with Christ first, instead patterning their operation off worldly systems. Only a child schooled in Christ within the whole church community will get a rounded education. The Church best speaks against worldviews, while allowing safety for the schooled to engage defective thought systems. Fitch advocates a return to full-blown catechism in Evangelical churches, starting in infancy. His own church has a goal of preparing all children for baptism and membership by age ten. He believes that all educations systems within a church reinforce each other, so that kids and adults get the same (age-appropriate) teachings matched to the church year lectionary. Running the children out of the church service is a mistake, too. A church that practices catechesis will by necessity be smaller in order that everyone know the people in the worshiping community. Such a church organizes its life around the community of believers, altering family schedules to put worship of Christ first. Armed with such a catachesis program, no one educational practice (public school, paraochial, or homeschool) will undermine the worldview instilled in our children. Therefore, any type of school might be chosen. In theory, I believe that Fitch is on track. He correctly identifies the flaws in every schooling system. He's absolutely right that we need to recover rites of passage within our churches. My own church is re-examining this need. Just this last Father's Day, we instituted an annual blessing of the children by their fathers (and mothers). I'm also a strong proponent of some type of catechism within the Church. I think we need some sort of worldview analysis and overview, too. Lastly, I believe the Church has a responsibility to prepare young people, starting as young as ten, for being Christian husbands and wives through some kind of marriage awareness program. That said, I think Fitch overlooks what can go wrong with catechism. One would hope that a church would handle catechism correctly, but as long as there are teachers, flaws exist. A bad set of teachers leads to a badly implemented catechism. I've favored more of a whole church rite that pulls all the church's men into a process by which they mentor the boys in the church, with a similar program for the girls. This mitigates the possibility of getting a lousy teacher who's not with the program. Like I said in the first installment of this three-part review, everyone should read this book. I'm sure you'll take umbrage with at least a few of the author's analyses and solutions, but that's good. Again, discernment is not a blanket condemnation. Think about what Fitch writes and lay it before the Lord. You may find the Lord changes your heart. Fitch understands the needs of the 21st century Church and the needs of those outside it. He correctly states our need for ritual, symbolism, art, and beauty within our congregations. His views concerning the need for real community—not the half-hearted attempt that passes for community in nearly every church—are prophetically accurate. Modernism has turned the Communion of Saints into an Army of One. But Christ never founded an Army of One; He founded a Church. Despite the faults of modernism, it can't become a boogeyman. It's too easy to blame modernism or postmodernism or some other -ism for our problems. What we need to do is get back to the simplicity of the Gospel. And that's what Fitch calls for in this book. I mentioned before that most of his solutions to the Western Church's problems are old school. If your idea of a finely tuned Church is not something Anglican circa 1790, then I ask that you at least consider what we may have lost in our churches since that time. Few of us would say we're better off spiritually than that age, so perhaps fine tuning Evangelicalism to incorporate that old school thinking wouldn't be a bad idea. Read the book. Any review is a disservice, especially with a book as densely packed with ideas as The Great Giveaway. Fitch has a blog, too (see Kingdom Links in the sidebar), so the conversation continues. Blessings. I hope this review provoked you—at least a little bit. For 5 years I worked with a Christian community development organization in Thailand. We defined development as “an ongoing process of positive change” with a caveat: There can be no positive change without Jesus Christ. Fitch’s assertion that there is no social justice outside the church has that one flaw of assuming that Jesus is in the Church. Rather, say there is no social justice outside of Jesus. I have a radical theory that says all endemic social ills can be traced to a lack of action on the part of the body of Christ. That is not to say that having an active body of believers in a community makes a mini-utopia, but instead that the issues would not be as huge as they are if the body had been pro-active in the first place. As to his confusion regarding capitalism or democracy, it’s a common mis-conception that gain for one means loss for another. One of the reasons communities do not develop is this warped concept of prosperity and wealth. In the 80’s I worked for ACSI for eight years as a printer, rolling out many of the books espousing the true path of education being Christian Schools. The founder of ACSI was Dr. Paul Kienel, and there was an ongoing argument amongst some of the staff over his belief that it was better for both parents to work and send their kids to a Christian School, than for one parent to stay home and send their kids to a public school. On the one hand was the supposedly positive atmosphere of the Christian School environment vs. the evil of the Public Schools with your kid stuck in the middle. I tended towards the one parent at home approach for one reason: Christian Education begins, has it’s being, and ends in the home. A child brought up in a Christian environment, taught right from wrong by his/her parents, and shown the Christian walk in the home, has nothing to fear from public schools. Unfortunately, too many parents allow their church and schools to usurp the proper role of a parent in educating their child. If we can’t have any assurance that Jesus is found in His Church, then the battle is already lost and we should all go home and await the apocalypse. BTW, I agree with your “radical theory.” My belief in that drives much of what you read on this blog. The Spiritual Formation chapter still has value. My overview doesn’t do it justice. Is every Christian school like this? I don’t think so. It may be true that Christian schools too closely mimic the operations of public schools, never forming a uniquely Christian approach to education, but that they’re overly nationalistic? That’s a weak argument, even if true.